The 2018 model year was a big one for the Ford SUV lineup thanks to the debuting Ford EcoSport, the all-new Ford Expedition, and the continued popularity of the Ford Escape and Explorer. The 2019 model year is looking to be even bigger thanks to the all-new Ford Edge lineup and its pair of all-new Edge trim levels. In an effort to boost the popularity of the Edge to bring it on par with the rest of the new Ford SUV lineup, Ford has completely reinvigorated the new Edge lineup for the 2019 model year. 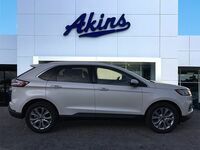 In addition to those two new trim levels, the 2019 Ford Edge lineup – which we have right here at Akins Ford near Atlanta, GA – features a number of segment-first safety features, a refreshed and updated exterior style, and a roomier and more functional interior. Those segment-first safety features include post-collision braking, evasive steering assist, and an adaptive cruise control system that itself features stop-and-go and lane centering capabilities. Furthermore, the all-new 2019 Edge lineup features an optimized airbag system, rain-activated windshield wipers, a rearview camera and much more. 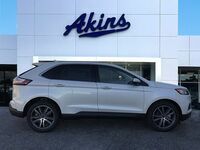 What are the Trim Levels and Engine Options of the 2019 Ford Edge Lineup at Akins Ford near Atlanta GA? Since the biggest news regarding the all-new 2019 Ford Edge lineup is the addition of two brand new trim levels, let’s begin there. 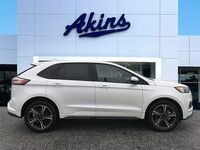 And we can’t talk about the all-new trim levels of the all-new Ford Edge lineup without starting with the 2019 Ford Edge ST. That’s because the all-new Edge ST is the first Ford SUV to ever be built by the Ford Performance Team, which gave it the most powerful V6 engine in its class. More specifically, the Ford Performance Team put a 2.7-liter twin-turbocharged EcoBoost engine under the hood of the 2019 Edge ST and mated it with an all-new quick-shifting 8-speed automatic transmission. All told, this combination offers up to 335 horsepower and 380 pound-feet of torque. 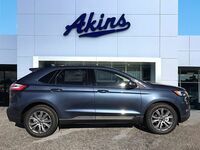 The other all-new trim level for the 2019 Edge lineup is the 2019 Ford Edge Titanium Elite. While not quite as powerful as the all-new Edge ST, the all-new Edge Titanium Elite is still a lot of fun to drive thanks to its 2.0-liter EcoBoost engine providing up to 250 horsepower and 275 pound-feet of torque. This engine, by the way, is the same engine that’s standard for the rest of the 2019 Ford Edge lineup. What really sets the 2019 Edge Titanium Elite apart from the rest of the Edge lineup is its new style features, which include a fully refreshed exterior complete with new body-color style features and exclusive 20-inch bright-machined aluminum wheels. 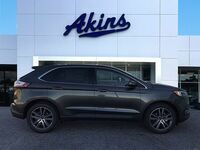 If you’d like to learn more about the 2019 Ford Edge lineup, please contact our friendly Akins Ford staff near Atlanta, GA.